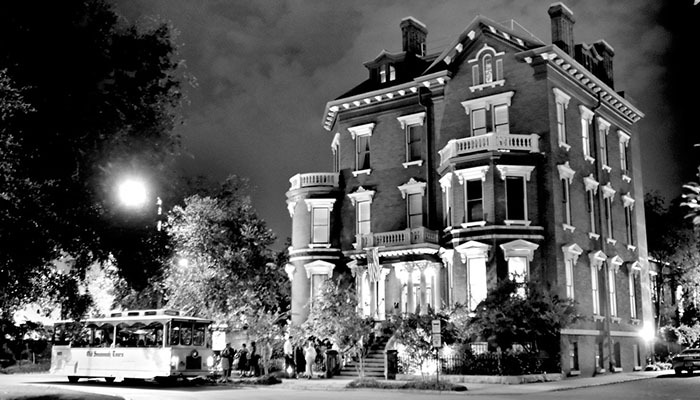 Forget haunted houses, Savannah, one of America’s Most Haunted Cities, has several supernatural sightings at the very places many guests rest each evening. 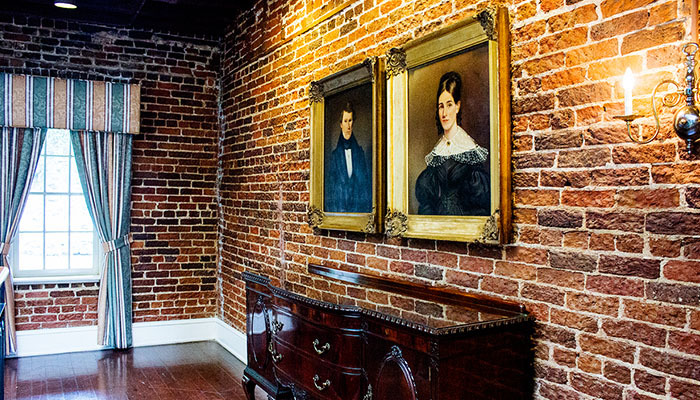 Whether it be eerie inns or ghostly guests spotted around the hotel grounds, Georgia’s First City has more than its fair share of spooky stories. 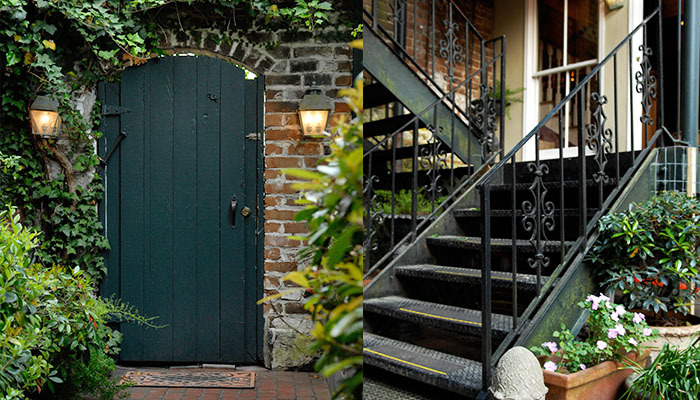 Stay at one of these haunted hotels in Savannah and you just might go home with one of your own. 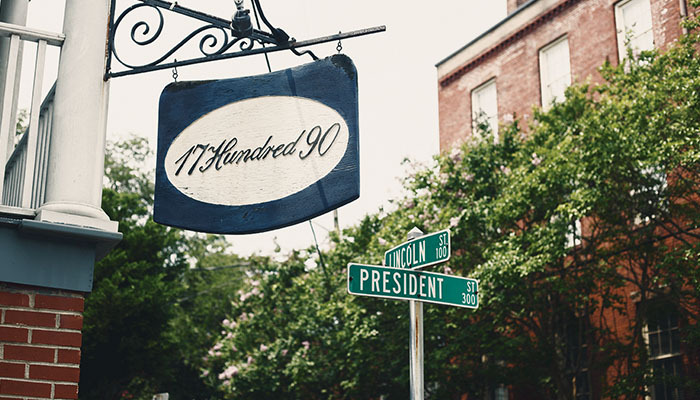 Emitting an aura of antebellum air and history, the charming and intimate 17Hundred90 Inn & Restaurant dates back to (you guessed it) 1790, when building’s ground level was erected. 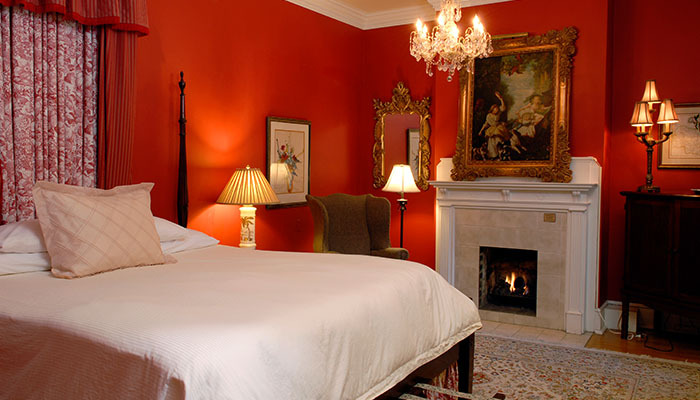 Most of the original building was destroyed in the Fire of 1820, but the three residencies which became the inn and restaurant were completed in the 19th century, with the hotel’s first two buildings constructed between 1821 and 1823 and the third in 1888. No matter where you wander in 17Hundred90, you have a high chance of coming in contact with one of this haunted hotel’s legendary ghosts. 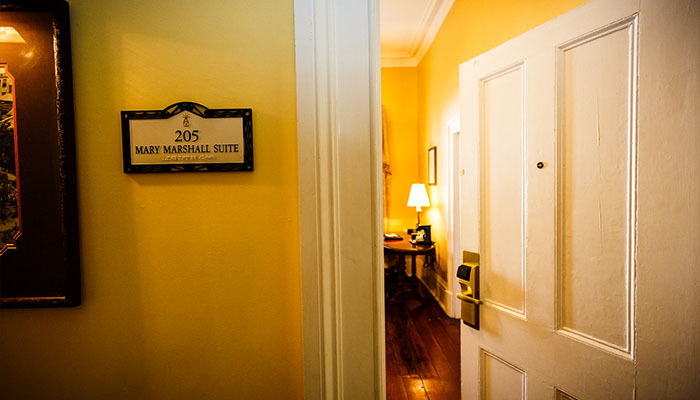 Make reservations for the top floor, specifically Room 204, to experience the surest amount of paranormal activity from 17Hundred90’s most famous and mischievous ghost. The ghost of Anne lurks throughout the room, and her presence can be physically and spiritually felt by Room 204’s temporary occupants. Anne, the name given to her ghost by the hotel’s staff, allegedly finds pleasure in messing with guests and their belongings. 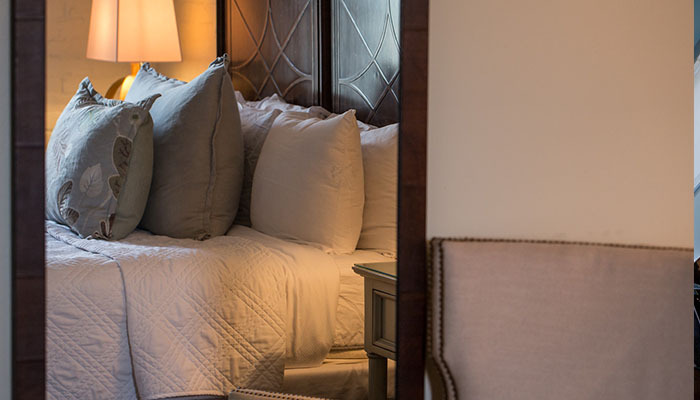 Guests who have stayed Room 204 in the past regularly reported returning to their rooms to find their personal items rearranged and, in some cases, missing. 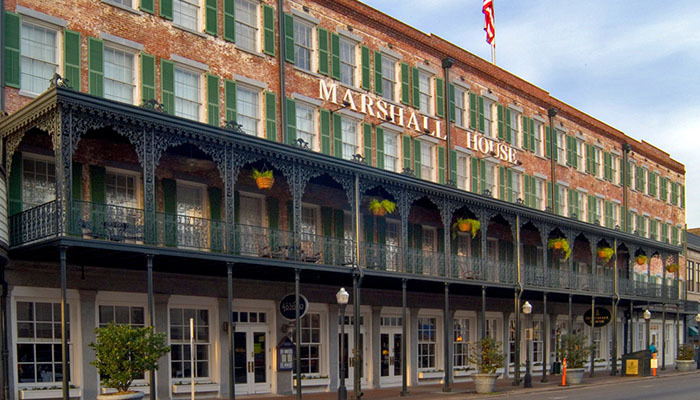 Don’t let the beautifully restored facade fool you; almost every haunted walking or trolley tour in the city features the Marshall House as a hotspot for ghost hunters. 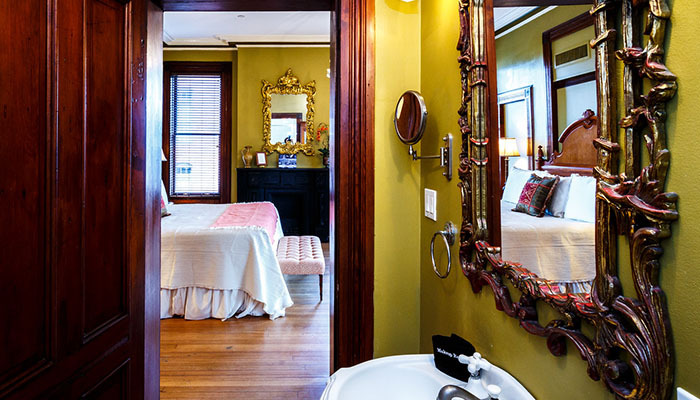 However, do not let this supernatural attribution scare you away from staying in one of the Marshall House’s gorgeous rooms. This hospital-turned-hotel was voted a USA Today “10 Best” winner and a Travel Channel featured hotel, and, thankfully, the hotel ghosts are friendly and harmless. 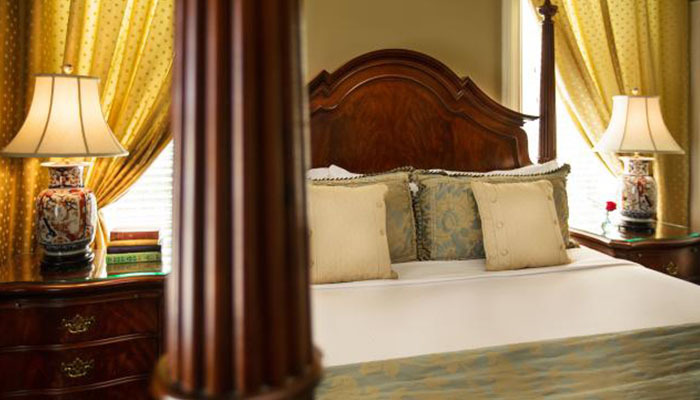 Opened in 1851, the hotel was used as a hospital on three separate occasions: once during the Civil War for the Union Army and twice during the rampant yellow fever epidemics of the 19th century. 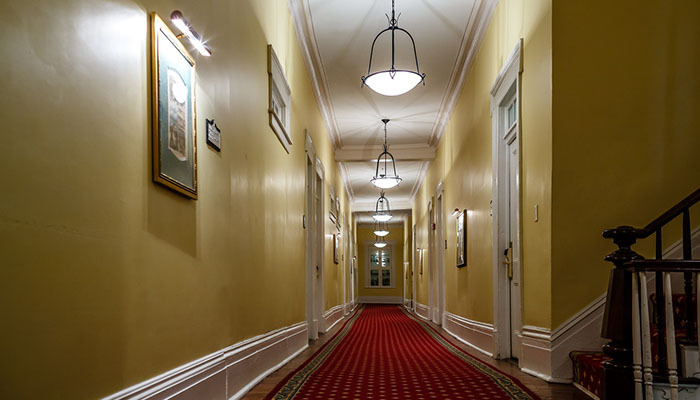 Ghostly occurrences reported by past hotel guests include hearing the sounds of children running down the hallways at night and seeing ghosts in the halls and foyers. 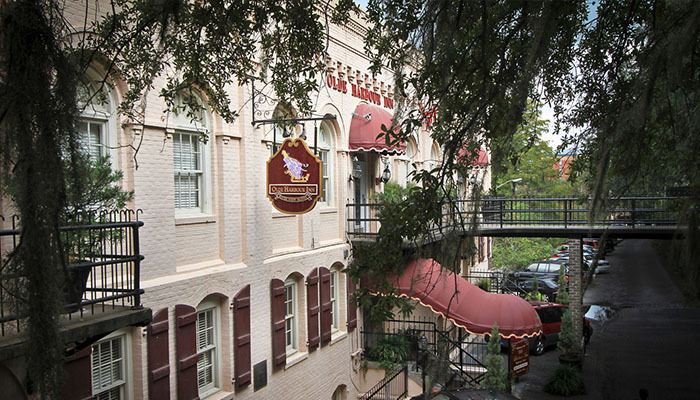 Other reports have mentioned some of the room faucets turning on by themselves and doorknobs rattling in this haunted hotel in Savannah. Down on Factors Walk near River Street is the Olde Harbour Inn, recognizable by its magenta awnings and maroon window shutters. 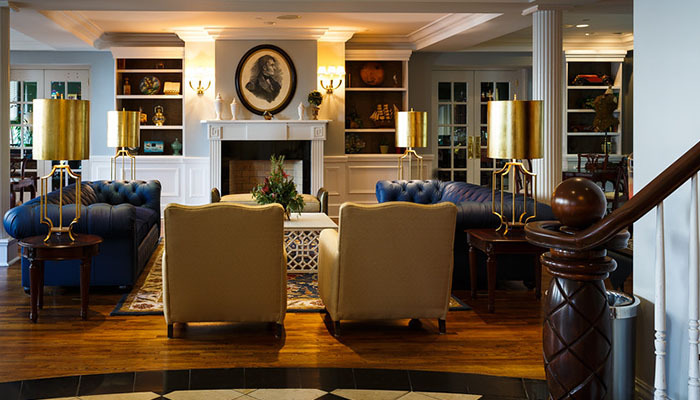 This boutique hotel marries a modern flare with its historic roots, dating back to 1812 when the site was first consisted of wharf warehouses and storage buildings. 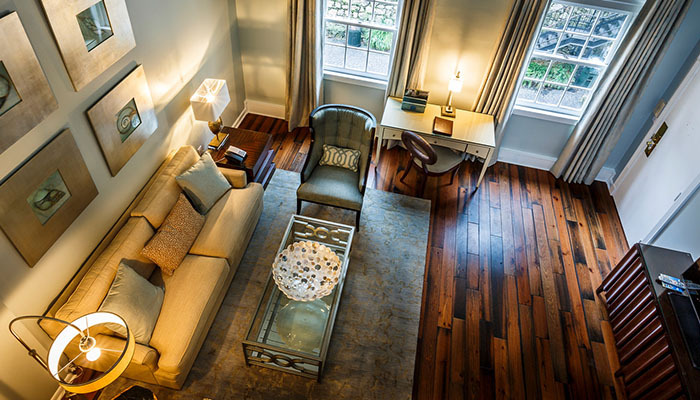 Savannah’s own Johnson and Jones families were the primary owners of the properties. Due to multiple issues concerning the use of docks and wharfs in this area, these original buildings were removed. The inn also endured a series of fires in its early years, which leads to the story of one of Olde Harbour’s most-encountered haunts, Hank. The legend goes that Hank is the spirit of a worker who died in one of those early fires. Though no evidence exists to support this theory, guests have reported the smell of cigar smoke even when no smokers were present. They also claimed objects moved around in their rooms and that they heard the sound of coins dropping on the floor. 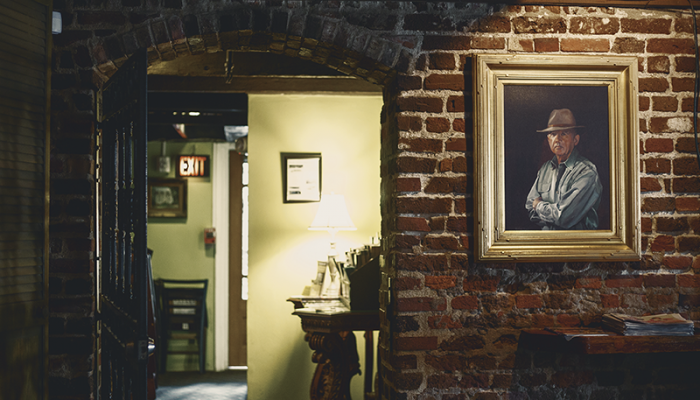 Should you witness any of these baffling incidents in this haunted hotel in Savannah, you now have a plausible explanation: the playful spirit of Hank. 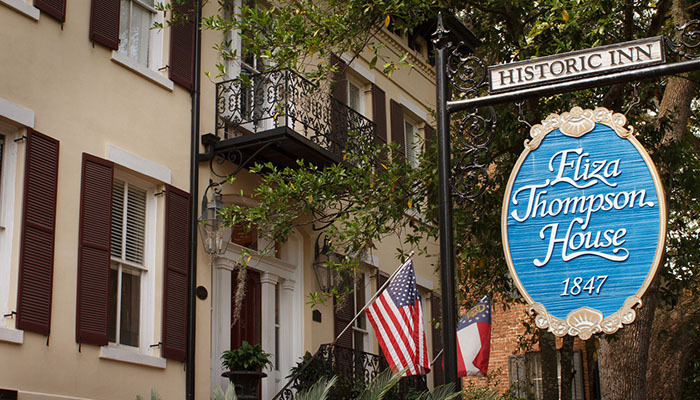 An oval-shaped blue sign signals Savannah’s guests to the Eliza Thompson House at 5 W. Jones St. Built in 1847 for Eliza and Joseph Thompson and their seven children, this converted private home saw many a party and extravagant celebration in its heyday as the first houses constructed on the now-iconic Jones Street. A second section was added to the original structure around 1870, which consisted of what is currently the front parlor, the Chatham room and the J. Stephens room. 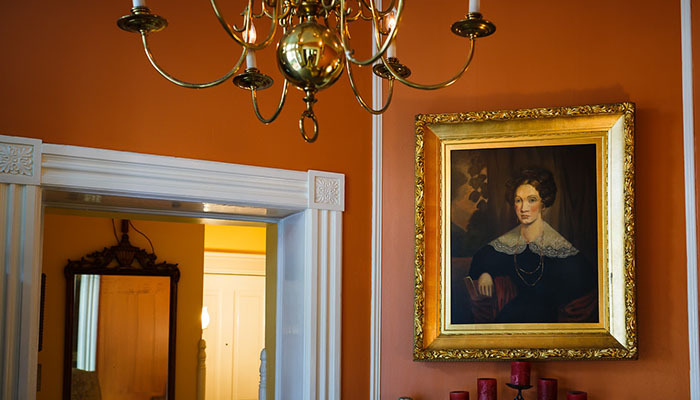 Today, the home is a popular Savannah bed and breakfast with just the right amount of spirited spooks and ghostly narratives. 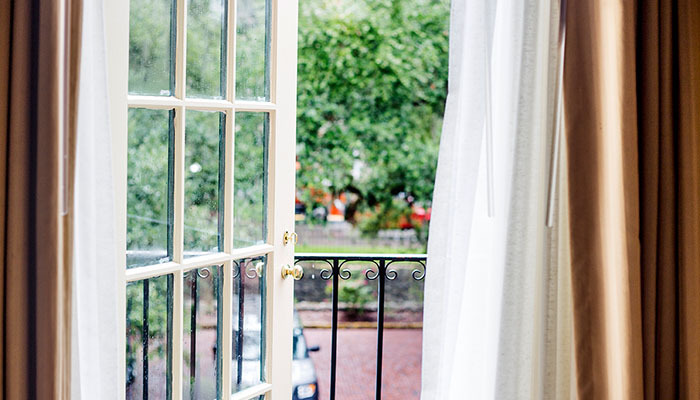 Since it first opened its doors for business, the Eliza Thompson House has seen its share of ghosts including Confederate soldiers in an upstairs window and a young girl wearing a white dress in one of the hallways. 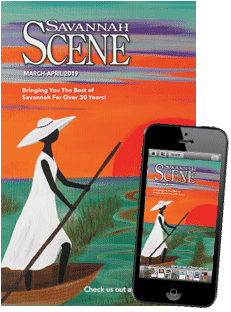 Writers from “South Magazine” actually conducted a paranormal investigation in the Eliza Thompson House several years ago by staying awake all night to study and observe the happenings in the home. On their specially made “Fright-O-Meter,” the writers concluded this house scored a 4.5 on a scale of 5. 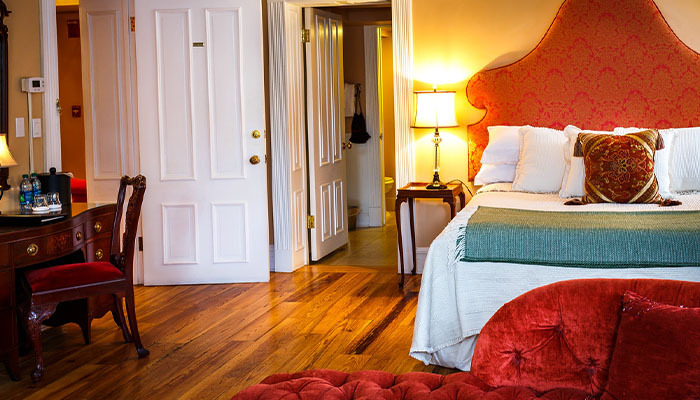 Recognized as the first bed and breakfast opened in Savannah, the Foley House Inn is pleasantly tucked away on Hull Street just around the corner from the Independent Presbyterian Church of Savannah. Constructed atop the remains of a home destroyed in the Great Savannah Fire of 1889, the house itself was finished in 1896 by Honoria Foley. Mrs. Foley was the widow of a wealthy Irish immigrant who erected the home to obtain more living space for guests. 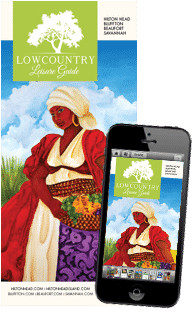 She and her widowed son and his five children lived peacefully in their home for many years, hosting their guests without any ghostly interferences. During home renovations in 1987, however, construction workers discovered human skeletal remains behind one of the home’s walls. 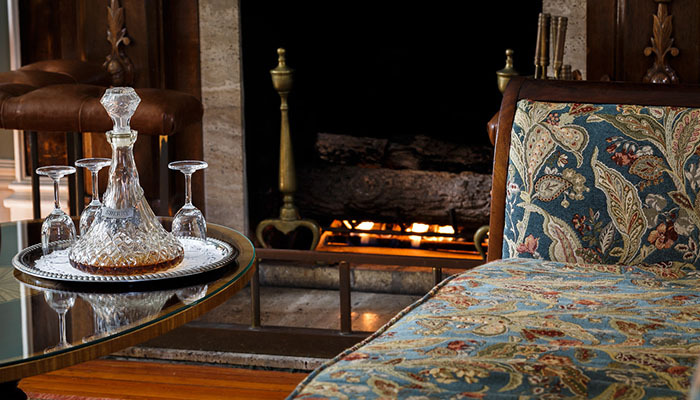 According to locals, this finding set loose an otherworldly apparition inside the inn. 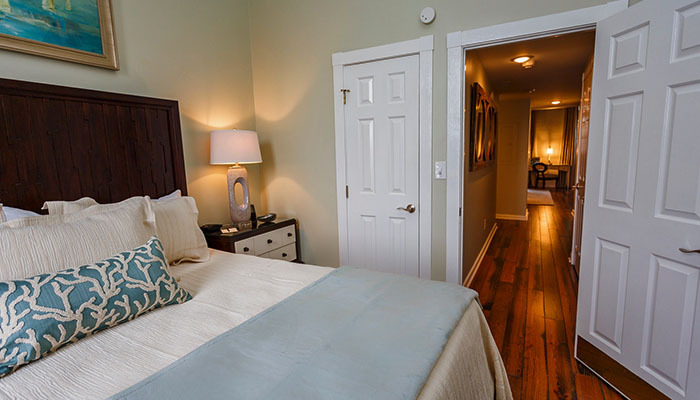 The bones and remains are said to belong to a boarder, named by the staff as Wally, who stayed at the Foley House in the late 19th century while visiting Savannah on a business trip. One night during his stay, Wally mysteriously disappeared and was never heard from again. 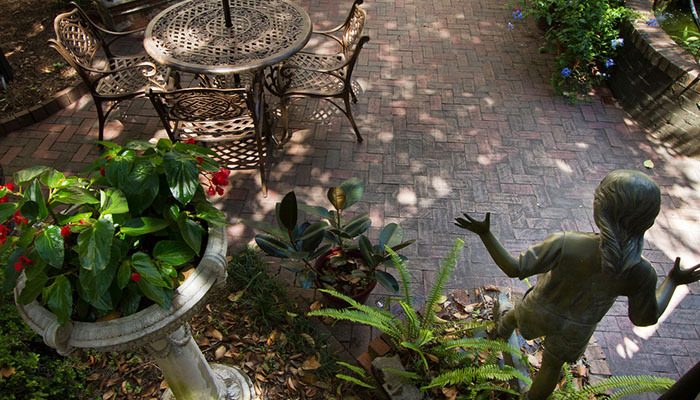 Staff at the Foley Inn often hear stories of a man in a top hat strolling in the garden at night, and guests have reported hearing odd noises during their stay. 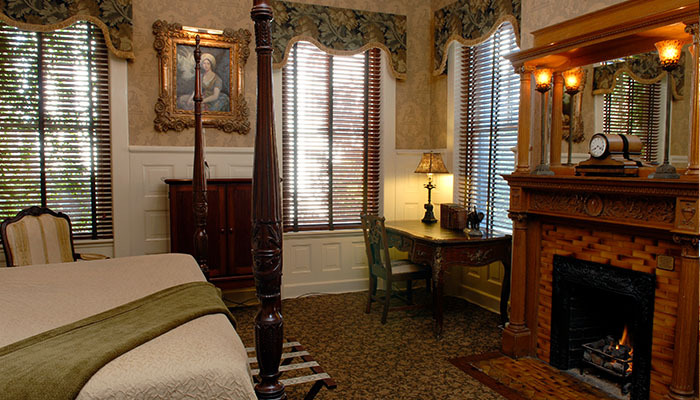 Don’t just take our word for it; head over to this haunted inn and find out for yourself! 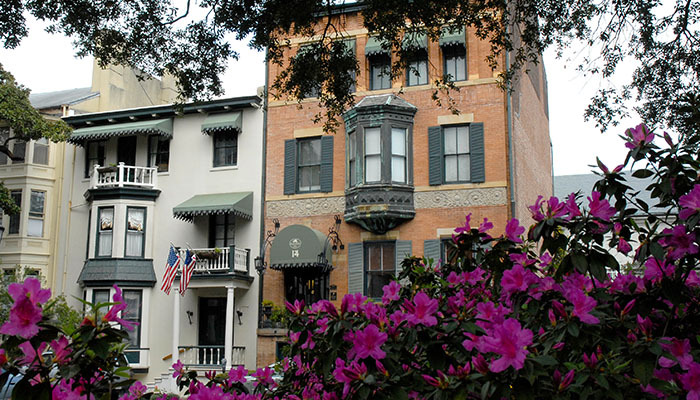 Lafayette Square is the front yard for the Hamilton-Turner Inn, Savannah’s AAA four-diamond hotel and home to some suspicious hauntings. 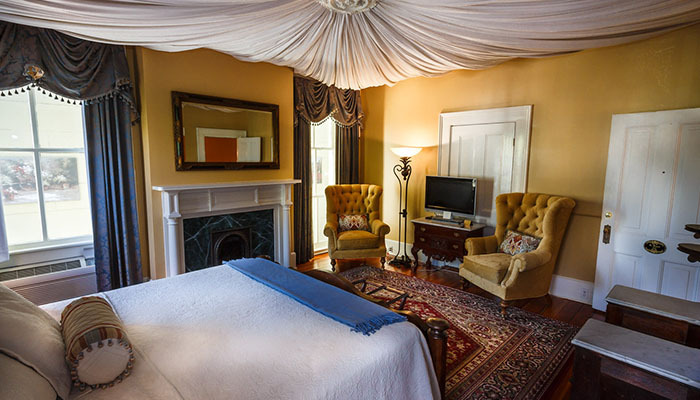 It was built for Samuel P. Hamilton in 1873, before crossing the hands of Doctor Francis Turner and several others until Charlie and Sue Strickland, acquired the property in 1997 and converted the mansion into the luxurious suites it is today. 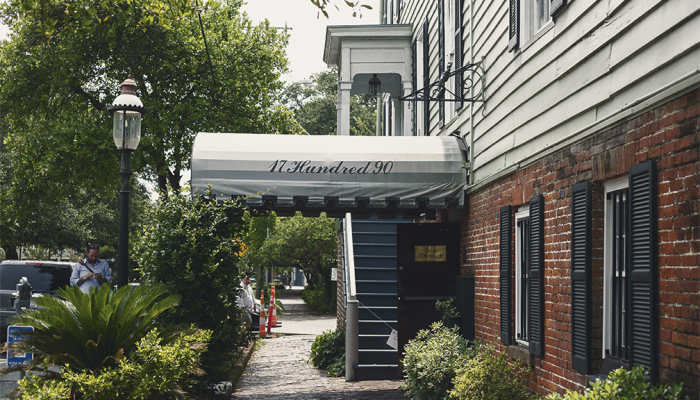 Visitors may recognize the inn from its description in John Berendt’s acclaimed bestseller, “Midnight in the Garden of Good and Evil,” in which Joe Odom played piano and threw grandiose parties as the manager of the inn. In terms of paranormal activity in the house, many guests claim of hearing children of Dr. Turner laughing and billiard balls bouncing, which his kids often played with, until one supposedly died after falling down the stairs chasing one. Other reports describe sightings of the ghost of a man, said to be a Confederate soldier, smoking a cigar on the rooftop with a rifle in his hand. However, some speculate that it’s not a soldier haunting the inn because it’s built on top of his burial ground, but Samuel Hamilton’s guard, who was murdered one night while on the roof, where he kept watch with a rifle, protecting Hamilton’s home and pricey collection of art. Some even go on to claim that it’s Hamilton himself, who got sick and died after taking his guard’s place on the roof to protect his home. 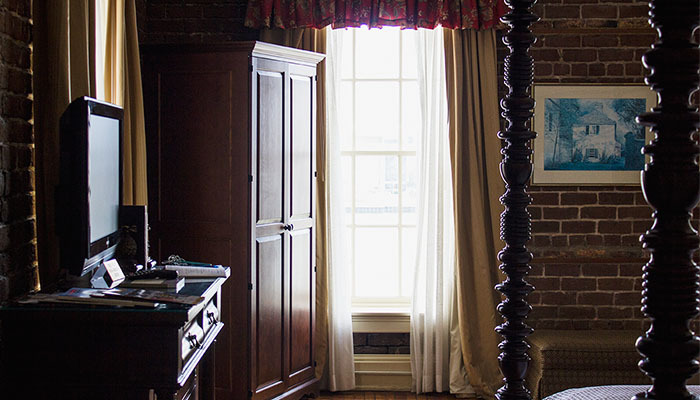 Not only can Savannah’s visitors stay in an old cotton warehouse, but they may also experience some seriously spooky encounters within their 200-year-old guest rooms. 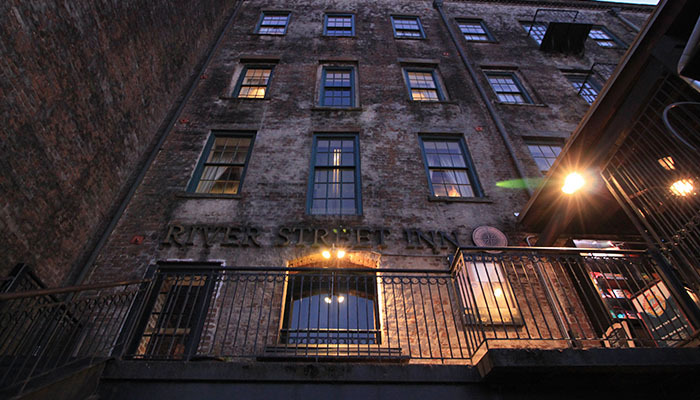 The River Street Inn, located on East Bay Street just steps from River Street, features five floors of guest accommodations and is the city’s only member of Historic Hotels of America, the official program of the National Trust for Historic Preservation. During the early part of the 19th century, Savannah was the second largest cotton seaport in the world. 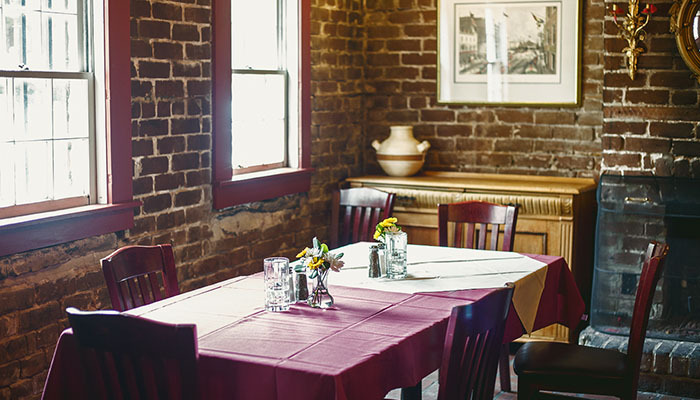 Built in 1817 out of recycled ballast stone, the inn’s original two floors housed the cotton that was moving through the port. 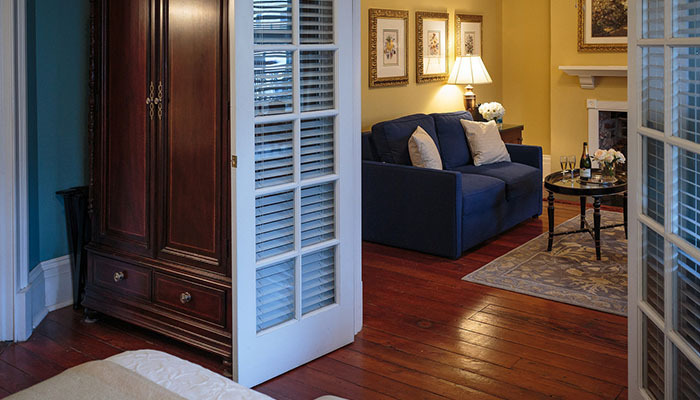 The hotel expanded its original layout of 44 guest rooms to 86 in 1998. 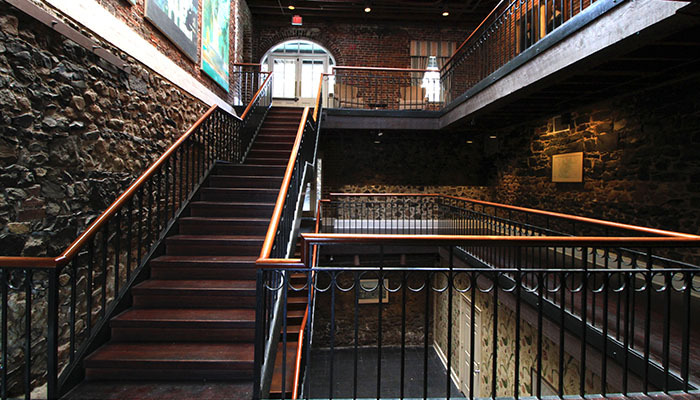 Some guests staying on the top floor, which is supposedly the most haunted wing, have reported the sound of big wheels rolling across the floor above, which could be hypothesized as spirits from the old warehouse. Others claim they’ve seen a man wearing a white shirt and tan pants, heard toilets flush when no one was in the bathroom and have found things moved around the room with no one to blame. 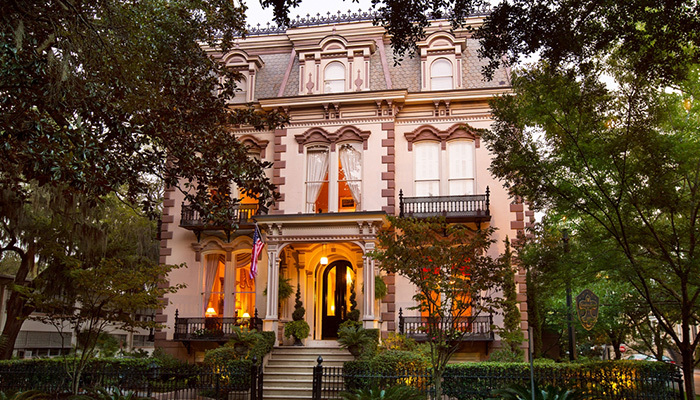 Situated at 123 Habersham St. on Columbia Square, the Kehoe House is an elegantly restored 1892 Renaissance Revival mansion named for its original inhabitants, William Kehoe and his family. 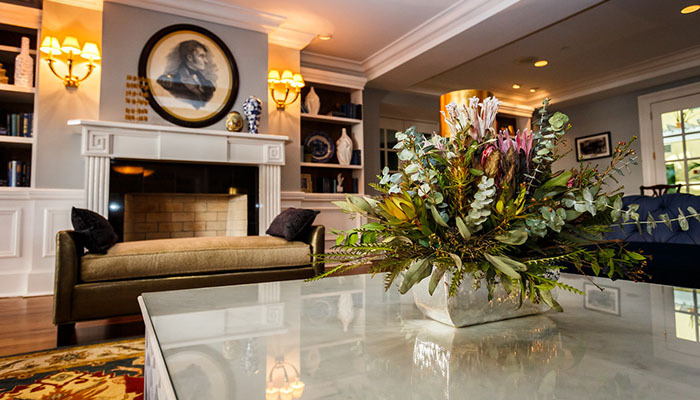 The house’s services varied from a boarding house to a funeral parlor, and it was even owned by Alabama and New York Jets football star, Joe Namath, until 1990. 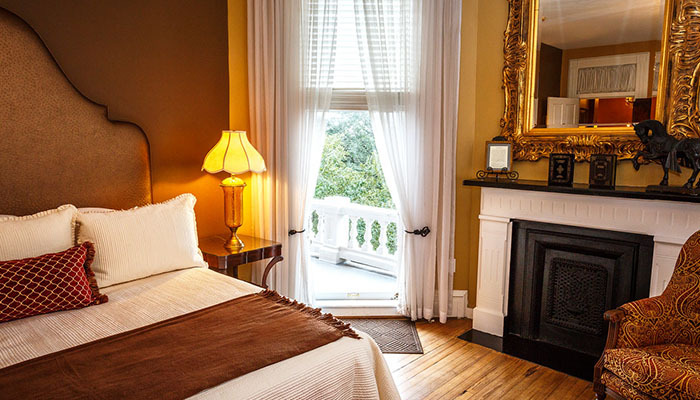 Later renovated and converted into an upscale bed and breakfast, the Kehoe House allegedly hosts the ghosts of some of the Kehoe children who died in the home. The sounds of those children at play continue to echo throughout the home. 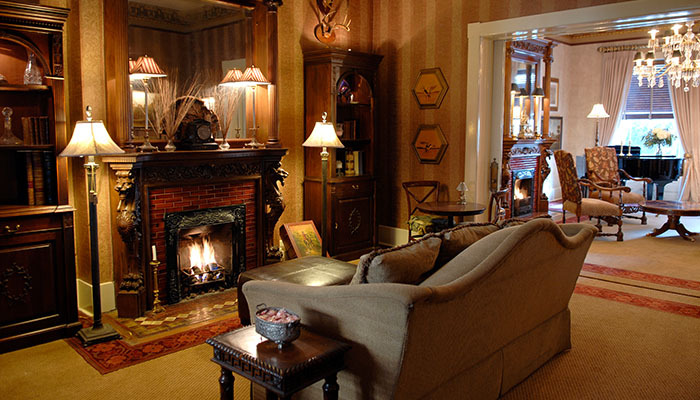 Two kinds of hauntings occur when guests stay at the Kehoe House: residual and intelligent. The former describes a ghostly replay of events or moments from the past at the haunted site. The latter details the sensational interactions between spirits and the living and those spirits’ ability to recognize them. 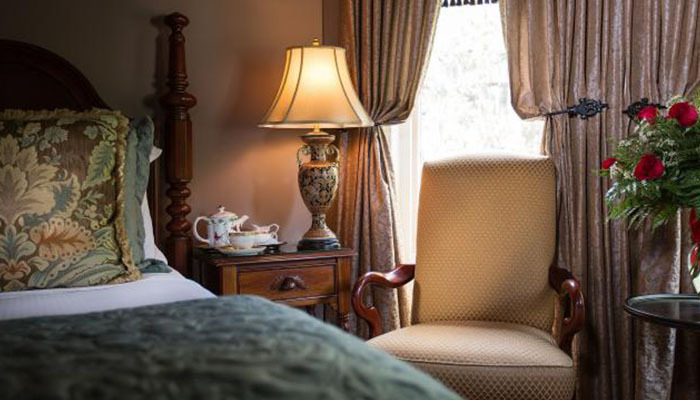 Guests have reported feeling a hand on their head while sleeping at the Kehoe House in addition to having their arm grabbed by an inexplicable phantom force. 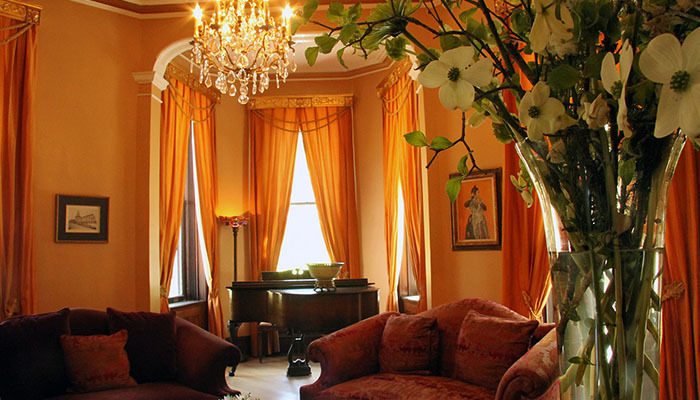 Guests have also reported the smell of aged perfumes drifting throughout through the halls to the bedrooms. 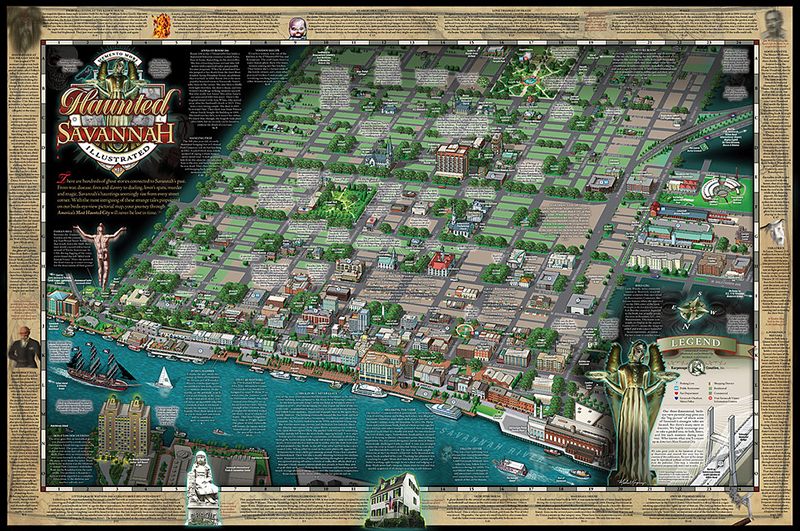 To find these haunted hotels in Savannah and discover the other paranormal sites in Savannah’s Historic District, you can purchase the Haunted Map of Savannah below for $5.50.